PVNS is an uncommon disease. Prevalence is approximately 9.2 cases of extra-articular and 1.8 cases of intra-articular disease per 1 million population. [1, 2] Localized lesions are more common than diffuse involvement, comprising 77% of total lesions in one review, with a 3.3:1 localized-to-diffuse predominance ratio. Diffuse PVNS affects predominantly large joints, with the knee being the most common (66-80%). [8, 9, 10] The hip, ankle, shoulder, and elbow follow in descending frequency. [11, 12, 13] The localized intra-articular form of PVNS occurs almost exclusively within the knee. Tendon sheaths of the hand and wrist are affected more frequently, with the volar aspect of the index and long fingers being the most common sites of disease. Diffuse PVNS has nearly equal incidence in male and female patients, while the localized form demonstrates a female-to-male predominance ratio of 1.5-2:1. Diagnosis is more common between ages 20 and 50 years, with a median age of 30 years. PVNS is overwhelmingly benign, with only a few cases of malignant transformation reported, but it may result in significant morbidity if left untreated. Pain, loss of function, and eventual joint destruction may result. The primary treatment options include surgical resection via synovectomy or radiation therapy. Recurrence is reduced with complete resection, and it is achieved more often with localized disease. Radiation therapy may be used as the primary treatment method or in concert with surgical excision. A combination of plain films and MRI should be used in preoperative evaluation of a patient with PVNS. This combination yields an accurate diagnosis and maps out the extent of disease for the surgeon prior to treatment. Pigmented villonodular synovitis of the knee. 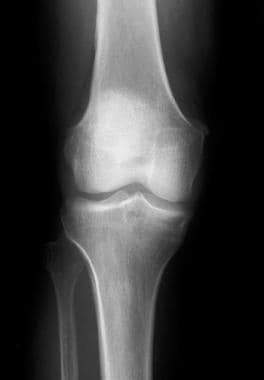 Plain radiographic findings of the knee apparently are normal except for the curvilinear calcification seen peripherally to the medial femoral condyle. Two primary forms of PVNS are described: a diffuse form that affects the entire synovial lining of a joint, bursa, or tendon sheath, and a rare focal, or localized, form. The diffuse form typically involves the large joints (see the first 2 images below), while the localized form typically occurs around the small joints of the hands and feet (see the last 2 images below). Pigmented villonodular synovitis of the knee. 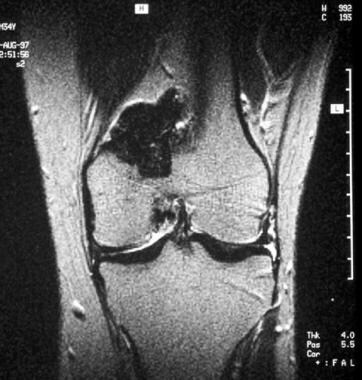 Coronal T2-weighted magnetic resonance imaging (MRI) scan shows low signal mass above the medial femoral condyle, posteriorly. Pigmented villonodular synovitis of the knee. 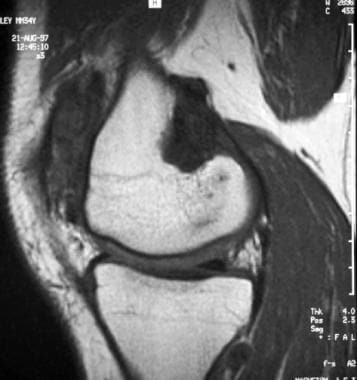 Sagittal T1-weighted magnetic resonance imaging scan (MRI) of the knee shows inhomogeneous foci of low signal in the suprapatellar pouch and, posteriorly, just above the femoral condyle. Giant cell tumor of tendon sheath. Anteroposterior plain film of the foot shows a circumferential mass, which is more apparent on the medial aspect of the proximal phalanx of the great toe. Note the degenerative cystic changes at the interphalangeal joint of the great toe. Mild saucerization or pressure erosion of the medial cortex of the proximal phalanx is seen. Giant cell tumor of tendon sheath. 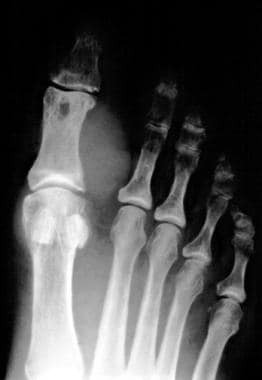 Axial T1-weighted magnetic resonance imaging (MRI) scan of the foot shows intermediate signal mass surrounding the proximal phalanx of the great toe and displacing the tendons away from the bone, especially in the plantar aspect of the foot. Neoplasia is the currently accepted underlying etiology, with empirical and genetic evidence supporting this theory. PVNS has demonstrated the capability of autonomous growth and rare malignant transformation. Several genetic studies have demonstrated associated cytogenetic aberrations, including rearrangement involving the CSF-1 and COL6a3 genes, as well as association with trisomy 5 and trisomy 7. [1, 20, 21] Not all cases are associated with such genetic anomalies, suggesting a multifactorial etiology for the disease. The localized form often appears around tendon sheaths, in which case it is termed giant cell tumor of the tendon sheath. It primarily affects the knee (66-80% of cases) but also affects the hips, ankle, shoulder, and elbow. Rarely, the localized form may develop around large joints. The term PVNS generally is used when the condition, in either diffuse or localized form, affects a joint. Imaging plays an important role in the diagnosis, treatment, and follow-up monitoring of the disorder. Plain radiographs cannot confidently exclude effusion as a cause of symptoms, nor can they help determine the extent of disease. CT scan findings invariably are diagnostic; however, CT scanning is hobbled by its inability to completely show the extent of disease and other pathology around or within the joint. MRI findings are diagnostic in more than 95% of patients. Rarely, synovial osteochondromatosis (SOC) may demonstrate a similar appearance, and plain radiographs may be necessary to exclude SOC in the appropriate setting. Findings on plain radiographs are not specific. (See the image below.) In the diffuse form, pigmented villonodular synovitis (PVNS) presents as painless, monoarticular joint swelling. Findings of mineralization of the bones around the lesion are normal until late in the disease, with preservation of the cartilage space and no calcifications. Well-corticated pressure erosions (saucerization) and cysts may occur on either side or both sides of the joint. Secondary degenerative changes may occur in the affected joint in long-standing disease, with concentric cartilage space narrowing, subchondral cyst, and osteophyte formation. The diffuse form presents with joint effusion/soft-tissue swelling. Occasionally, the effusion is dense because of the presence of hemosiderin. The nodular form most commonly results in localized swelling of the palmar aspect of a finger. Secondary to the presence of intracellular and extracellular hemosiderin, lesions have high attenuation and appear hyperdense on CT scans. Because of improved tissue contrast, CT scanning is valuable in delineating bone cysts and erosions. Affected synovium is hypervascular and generally enhances following administration of radiographic contrast. CT scanning is useful for needle biopsy guidance when a histologic diagnosis is required and is especially useful for preoperative planning. Hemophilic arthropathy, synovial hemangioma, synovial chondromatosis, gout, and amyloid arthropathy may all present similarly on MRI. Pigmented villonodular synovitis of the knee. Axial T1- and T2-weighted magnetic resonance imaging (MRI) scans show tissue areas with abnormally low and high signals anteriorly in the suprapatellar pouch and, posteriorly, deep and superficial to the medial head of the gastrocnemius (Baker and popliteal bursae). Pigmented villonodular synovitis of the knee. 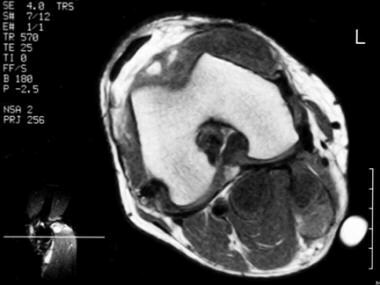 Axial T1- and T2-weighted magnetic resonance imaging (MRI) scans show tissue areas with abnormal low and high signals anteriorly in the suprapatellar pouch (same patient as in the previous image) and, posteriorly, deep and superficial to the medial head of the gastrocnemius (Baker and popliteal bursae). Pigmented villonodular synovitis of the knee. Axial T1- and T2-weighted magnetic resonance imaging (MRI) scans performed at a higher level above the knee joint show mixed signal pattern in the suprapatellar pouch. Nodular, low-signal foci are interspersed within inhomogeneous low- and high-signal areas. The foci correspond to areas of hemosiderin-laden hyperplastic synovium of pigmented villonodular synovitis. The presence of fat signal also is apparent secondary to the presence of lipid-laden macrophages, resulting in focal regions of high signal intensity on T1-weighted images and intermediate signal on T2-weighted images. Hyperplastic and hypervascular synovium enhances following intravascular administration of gadolinium chelates. Bony erosions (when present) and extra-articular extension of the lesion are well demonstrated on MRI. MRI findings are not pathognomonic for PVNS, and similar findings may be seen in rheumatoid arthritis, hemophilic arthropathy, amyloid arthropathy, synovial osteochondromatosis, gout, and degenerative joint disease. Bone scans do not play a significant or routine role in the diagnosis of pigmented villonodular synovitis (PVNS). On bone scan, the hypervascularity and areas of erosion may result in increased radionuclide uptake. Soft-tissue masses often demonstrate increased uptake on blood-pool images. Positron emission tomography (PET) imaging is of similarly little utility in establishing the diagnosis or extent of involvement of PVNS. The lesions are generally hypermetabolic. Unsuspected lesions may be found during surveillance for neoplasia on PET scans. Steinmetz S, Rougemont AL, Peter R. Pigmented villonodular synovitis of the hip. EFORT Open Rev. 2016 Jun. 1 (6):260-266. [Medline]. Elumogo CO, Kochenderfer JN, Civelek AC, Bluemke DA. Pigmented villonodular synovitis mimics metastases on fluorine 18 fluorodeoxyglucose position emission tomography-computed tomography. Quant Imaging Med Surg. 2016 Apr. 6 (2):218-23. [Medline]. Nordemar D, Öberg J, Brosjö O, Skorpil M. Intra-Articular Synovial Sarcomas: Incidence and Differentiating Features from Localized Pigmented Villonodular Synovitis. Sarcoma. 2015. 2015:903873. [Medline]. Gouin F, Noailles T. Localized and diffuse forms of tenosynovial giant cell tumor (formerly giant cell tumor of the tendon sheath and pigmented villonodular synovitis). Orthop Traumatol Surg Res. 2017 Feb. 103 (1S):S91-S97. [Medline]. Karami M, Soleimani M, Shiari R. Pigmented villonodular synovitis in pediatric population: review of literature and a case report. Pediatr Rheumatol Online J. 2018 Jan 17. 16 (1):6. [Medline]. Botez P, Sirbu PD, Grierosu C, Mihailescu D, Savin L, Scarlat MM. Adult multifocal pigmented villonodular synovitis--clinical review. Int Orthop. 2013 Apr. 37 (4):729-33. [Medline]. Myers BW, Masi AT. Pigmented villonodular synovitis and tenosynovitis: a clinical epidemiologic study of 166 cases and literature review. Medicine (Baltimore). 1980 May. 59(3):223-38. [Medline]. Mukhopadhyay K, Smith M, Hughes PM. Multifocal PVNS in a child--followed over 25 years. Skeletal Radiol. 2006 Jul. 35(7):539-42. [Medline]. Kim DE, Kim JM, Lee BS, Kim NK, Lee SH, Bin SI. Distinct extra-articular invasion patterns of diffuse pigmented villonodular synovitis/tenosynovial giant cell tumor in the knee joints. Knee Surg Sports Traumatol Arthrosc. 2018 Nov. 26 (11):3508-3514. [Medline]. Patel KH, Gikas PD, Pollock RC, Carrington RW, Cannon SR, Skinner JA, et al. 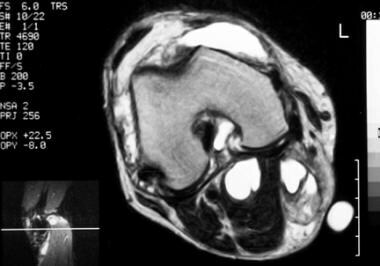 Pigmented villonodular synovitis of the knee: A retrospective analysis of 214 cases at a UK tertiary referral centre. Knee. 2017 Aug. 24 (4):808-815. [Medline]. Muramatsu K, Iwanaga R, Tominaga Y, Hashimoto T, Taguchi T. Diffuse Pigmented Villonodular Synovitis Around the Ankle. J Am Podiatr Med Assoc. 2018 Mar. 108 (2):140-144. [Medline]. Levy DM, Haughom BD, Nho SJ, Gitelis S. Pigmented Villonodular Synovitis of the Hip: A Systematic Review. Am J Orthop (Belle Mead NJ). 2016 Jan. 45 (1):23-8. [Medline]. Koto K, Murata H, Sakabe T, Matsui T, Horie N, Sawai Y, et al. Magnetic resonance imaging and thallium-201 scintigraphy for the diagnosis of localized pigmented villonodular synovitis arising from the elbow: A case report and review of the literature. Exp Ther Med. 2013 May. 5 (5):1277-1280. [Medline]. Bertoni F, Unni KK, Beabout JW, Sim FH. Malignant giant cell tumor of the tendon sheaths and joints (malignant pigmented villonodular synovitis). Am J Surg Pathol. 1997 Feb. 21(2):153-63. [Medline]. Shabat S, Kollender Y, Merimsky O, et al. The use of surgery and yttrium 90 in the management of extensive and diffuse pigmented villonodular synovitis of large joints. Rheumatology (Oxford). 2002 Oct. 41(10):1113-8. [Medline]. Lang N, Yuan HS. Computed Tomography and Magnetic Resonance Manifestations of Spinal Pigmented Villonodular Synovitis. J Comput Assist Tomogr. 2015 Jul-Aug. 39 (4):601-6. [Medline]. Lynskey SJ, Pianta MJ. 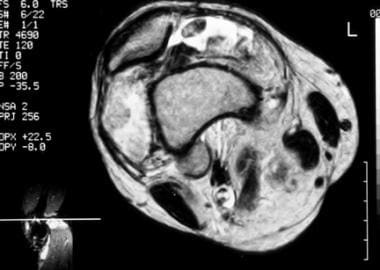 MRI and Thallium features of Pigmented Villonodular Synovitis and Giant Cell Tumours of Tendon Sheaths: A retrospective single centre study of imaging and literature review. Br J Radiol. 2015 Oct 6. 20150528. [Medline]. Broski SM, Murdoch NM, Skinner JA, Wenger DE. Pigmented Villonodular Synovitis: Potential Pitfall on Oncologic 18F-FDG PET/CT. Clin Nucl Med. 2015 Jul 7. [Medline]. Le WJ, Li MH, Yu Q, Shi HM. 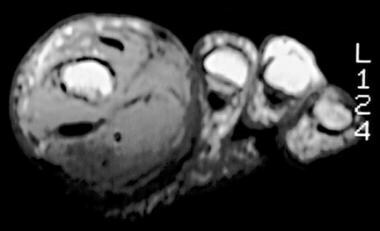 Pigmented villonodular synovitis of the temporomandibular joint: CT imaging findings. Clin Imaging. 2014 Jan-Feb. 38 (1):6-10. [Medline]. Cupp JS, Miller MA, Montgomery KD, et al. Translocation and expression of CSF1 in pigmented villonodular synovitis, tenosynovial giant cell tumor, rheumatoid arthritis and other reactive synovitides. Am J Surg Pathol. 2007 Jun. 31(6):970-6. [Medline]. Möller E, Mandahl N, Mertens F, Panagopoulos I. Molecular identification of COL6A3-CSF1 fusion transcripts in tenosynovial giant cell tumors. Genes Chromosomes Cancer. 2008 Jan. 47(1):21-5. [Medline]. Bui-Mansfield LT, Youngberg RA, Coughlin W, Chooljian D. MRI of giant cell tumor of the tendon sheath in the cervical spine. J Comput Assist Tomogr. 1996 Jan-Feb. 20(1):113-5. [Medline]. Frassica FJ, Khanna JA, McCarthy EF. The role of MR imaging in soft tissue tumor evaluation: perspective of the orthopedic oncologist and musculoskeletal pathologist. Magn Reson Imaging Clin N Am. 2000 Nov. 8(4):915-27. [Medline]. Jelinek JS, Kransdorf MJ, Shmookler BM, et al. 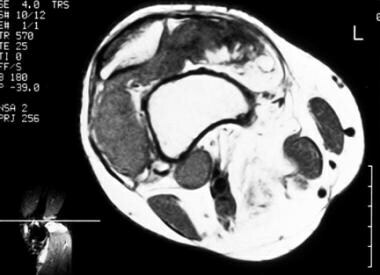 Giant cell tumor of the tendon sheath: MR findings in nine cases. AJR Am J Roentgenol. 1994 Apr. 162(4):919-22. [Medline]. Jelinek JS, Kransdorf MJ, Utz JA, et al. Imaging of pigmented villonodular synovitis with emphasis on MR imaging. AJR Am J Roentgenol. 1989 Feb. 152(2):337-42. [Medline]. Ugai K, Morimoto K. Magnetic resonance imaging of pigmented villonodular synovitis in subtalar joint. Report of a case. Clin Orthop. 1992 Oct. (283):281-4. [Medline]. Giant cell tumor of tendon sheath. Coronal T1-weighted, fat-saturated, contrast-enhanced MRIs showing a well-defined enhancing mass along the medial aspect of the thumb, without appreciable effect on the underlying bone. Localized intra-articular pigmented villonodular synovitis (PVNS). Lateral radiograph of the knee in a patient with localized intra-articular PVNS showing a moderate-sized effusion in the suprapatella pouch and soft-tissue fullness in the Hoffa fat pad. Diffuse-type pigmented villonodular synovitis (PVNS) in the ankle. Lateral radiograph demonstrates a prominent soft-tissue mass seen both in the anterior and posterior aspects of the joint. Diffuse-type pigmented villonodular synovitis (PVNS) of the ankle. Sagittal intermediate-density MRI of the ankle showing a soft-tissue mass along the anterior tibiotalar joint, with smaller soft-tissue masses posteriorly, which proved contiguous throughout the ankle. Giant cell tumor of tendon sheath. Axial T1-weighted image of the ankle demonstrates a low-signal lesion anterior to the tibiotalar joint, which proved intimately related to the tibialis anterior tendon. We wish to thank Simone Elvey, MD, for her previous contributions to this article.